From New York to Shanghai, New York back again, then London… and here we go with Milan! I still have so many images to share with you from our trips in all of these cities but I want to keep up with the pace of fashion month and show you a little bit of everything before then coming back to some key moments. It happened some days, depending actually on the quantity of shows planned, that I changed several timesof outfit per day. So sometimes, we shot a multitude of articles for Kayture in just a few hours. It even went up to something like 4. Imagine only the amount of content I have for you guys, get ready as I am going to harass your feed very soon!!! I just came back from the most delicious dinner with friends in Paris at the Kong restaurant. As you might have understood, we just flew in the city from Milan for the last part of our fashion week adventure. It so important for me to find the time to enjoy this experience and take some time off to relax and take distance from things with some people we love. This super rhythmic, quick and hectic pace is quite tiring to be totally honest… But so rewarding and memorable at the same time! We want to be as energetic and awake as possible to be able to enjoy all these amazing opportunities at the fullest! So it’s important to find a healthy balance. It’s also crucially important to consider little breaks in between shows, events, parties and meetings. We’ve been trying to do our best, but this season has really been full so far, which is obviously great as it means that things are going well, but it’s also more tricky to organize efficiently our calendar. So far so good. Trying to keep it up! Milan fashion week has always been one of my favorite ones. Even though the shows in Paris might be some of the most iconic ones, I always felt very deeply bonded with Italian culture, surprisingly. My grand, grand father was actually italian. So I might have some roots or blood somewhere in me that explains why I feel so incredibly good while in Milan. I always loved the colorful collections, the prints, the extravaganza… Not to mention the gelato at every meal, the delicious coffee, burrata and so on. I just love it!!! We’ve managed to develop such good relationships with brands there and it’s almost like coming back to friends when we are in the city. Today, I’m happy to share with you guys a look I wore to the Roberto Cavalli fashion show. The sweater from their Just Cavalli collection was of course the centerpiece of the whole look with it’s bold, deep blue color. I loved the sporty cut of it with the neoprene texture which felt so comfortable and added this interesting twist in the texture. On top of that and to break the edgy look, I added some colorful details and of course some gold as it’s the highlight of this season! 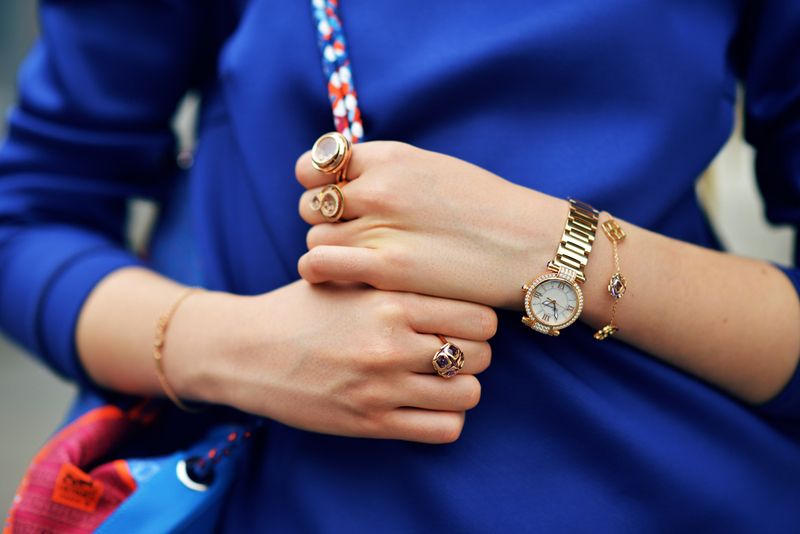 Wearing a watch and bracelet by Chopard from their Impérial collection as well as these adorable Happy Diamonds rings which looked so fun and playful during the day. Gorgeous outfit! Love this ensemble. Kristina, you're absolutely gorgeous. Just a simply A-M-A-Z-I-N-G. I am in love with this outfit it is beautiful ! I love how you paired the very sporty looking sweater with such a girly skirt and pair of heels. Perfect. Beautiful look! The jewels are breathtakingly beautiful! These pictures are gorgeous. 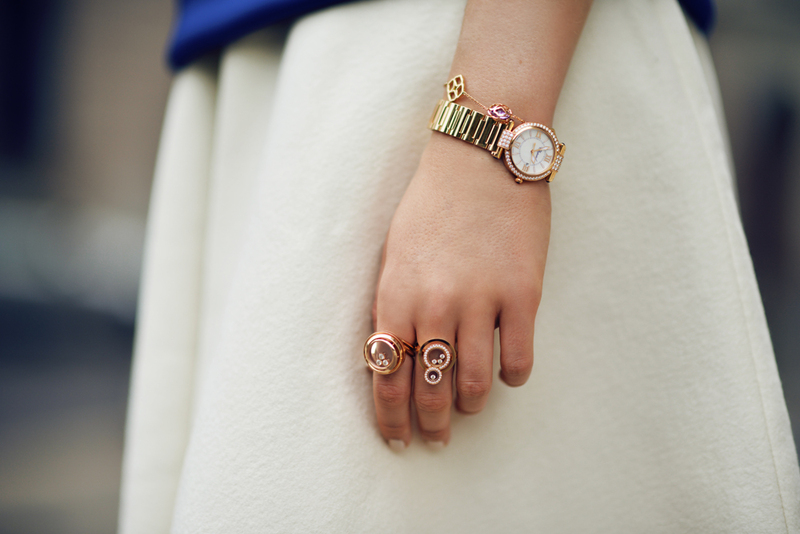 The way you accessorize is so inspiring. The watch with the rings and bracelet all together have a unique look. Great styling! 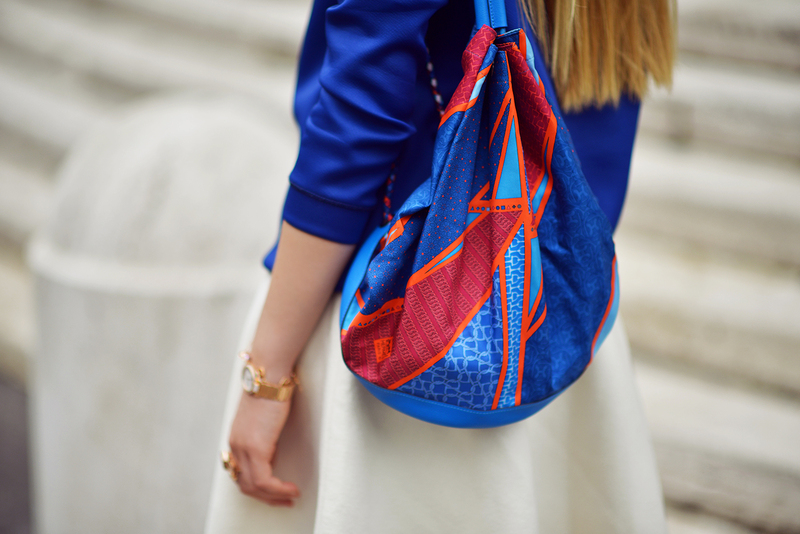 Adore this outfit, the different colours and shapes work so well together. Also in love with the jewelry, such great pieces! Such a happy and pretty outfit! Love the colors and the textures so much! Great post! Love your outfit! Can't wait to see the rest of the photos from your trip! & your makeup is flawless! I love how the outfit is so 'downtoned' but still looks so luxurious! and that color! Amazing, fits you perfectly :-). I love this outfit. So different to what you usually where but so good. Dear Kristina, a girl should be two things: classy and fabulous! And this is what you are! Such a cute mix of colors! Love the midi skirt and the neoprene sweater! Amazing photos, I love the colors and the jewels! The jewelry is simply beautiful. 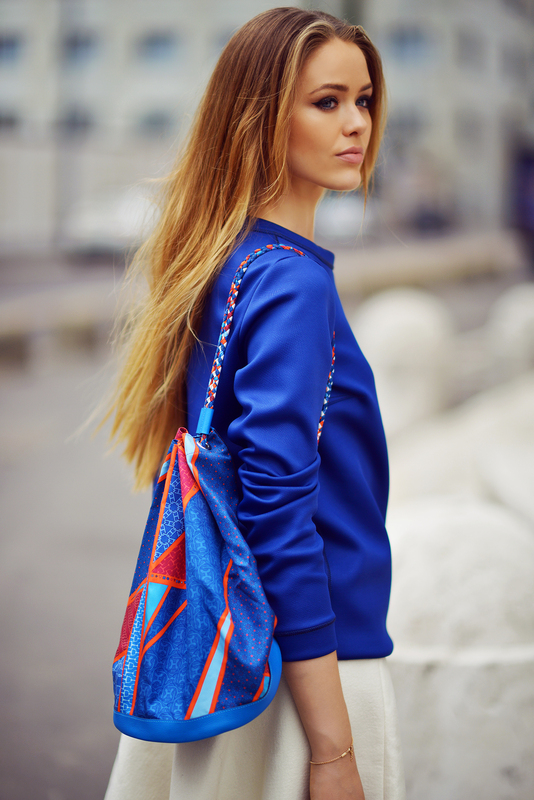 And love the vibrant blue and this gorgeous bag! Your look is great, I love these Choo's shoes. Beautiful outfit! Love the blue and white combo! You always wear so beautiful jewells! Great outfit! I Like royal blue in combination with amazing pink sandals. Jewelery is also perfect. The blue and pink is great. Can't take my eyes off the shoes! They are SO beautiful!! Those shoes are absolutely fabulous ! Great pics. Love that blue color! It's stunning! Loveee this look! That colour looks so stunning on you! This look is so cool! I love how you tackled the sporty trend but managed to still keep it feminine and elegant! And you weren't afraid of color! Hope you are having a fabulous time! I'm not a fan of this look (especially don't like the bag..) but the jewelry is just ah-mazing! Absolutely gorgeous colours! And bag is love! Love the Cavalli Sweater the colour is my favourite it just pops. Great outfit! This look is so chic, love it so much! & those jewels are stunninggg! Already loved your Look on Instagram! Your Jimmy Choos are so perfect :) You look gorgeous as always Kristina! Lovely! Those shoes are perfect! I love the vibrancy of this outfit. I also love Milan! I'm amazed at how you can be standing after all that intense traveling and running from meeting to show to photoshoot. Great work! That sweater is gorgeous! Royal blue is a stunning color!! Such a beautiful outfit! Absolutely love the shoes - though I have the feeling they are quite painful after all these days running on heels from show to show? Totally love the color combination! Great outfit. Those heels are bomb !!! Those Shoes are EVER sooo PRETTY in Pink! Just lovely! Go here for Gmail information and Solutions! I am Ellen mona. I have a lot of interest in reading, researching and writing. I work as a content writer at mallmasti.com. It is India’s one of the best websites for providing perfect online deals. Here you will find deals from a various popular ecommerce websites like Flipkart, Amazon and Reliance. But the interesting part is that you’ll find these deals on an even lesser price. This means that here you can grab double profit. So, if you are planning to shop online but and still wondering which site to buy from, check out our website. I am ellenmona. I am a content writer. My genre in writing is Health and Lifestyle. This could be the reason for making me interested in your website. I have been visiting here from quiet some time. This has given me a lot of knowledge and new ideas. Thank u! You can visit my person blog too and now i created an article or blog on mahandi for ladies.